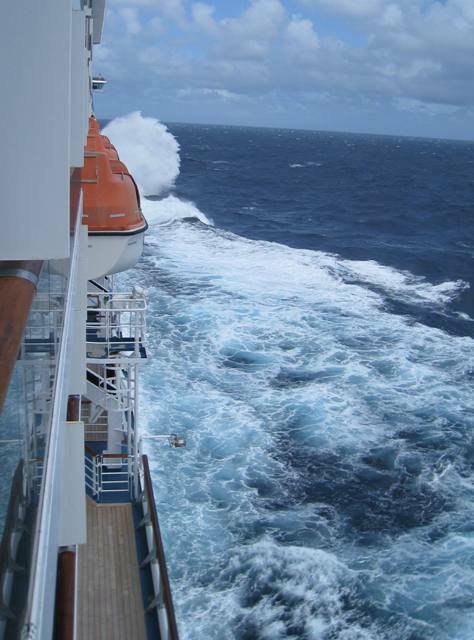 Our last day at sea was a rocky one, but the seas seem to be calming down as we approach the Chesapeake. We managed to outrun Tropical Storm Danny and fight high winds from the north. This is the worst part of any cruise – the last night. Time to pack the bags and say good-bye to all the wonderful crew and guests we have bonded with for the past 8 nights. This cruise has been wonderful in so many ways. Great food and more importantly terrific service. Our cabin steward Daniel from Haiti has done an amazing job keeping our stateroom fresh. 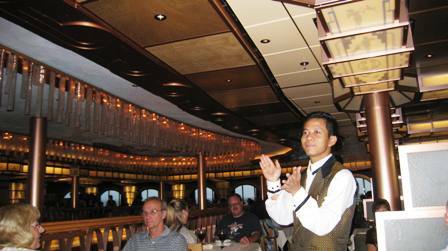 Waiters Kadek and Ali from Indonesia have been superb by providing us with top-notch service in the main dining room. Maitre’d Andrea from Italy has orchestrated a perfect service ambiance for all the guests onboard and Sen, the amiable “table artist” from India, has performed amazing magic tricks for the kids. Being able to drive to a cruise offers great convenience, not to mention tremendous cost savings by not having to buy airline tickets. Carnival has a winner sailing the Pride out of Baltimore year round. Every guest I have spoken with wants to come back for another cruise. Simply put – you can’t beat the convenience and amazing value for the money.